My Lady is called upon as a goddess of wisdom and a patroness of learning by traditions across the world, from India to Japan. 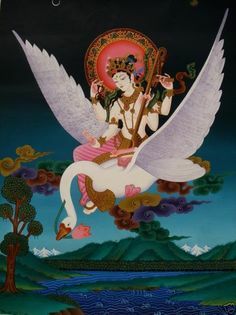 She is known not just as Saraswati, but as Yangchenma and Benzaiten-sama. She is a goddess of sense-finding and pattern making, of narrative construction and storytelling. She forces chaos into coherence, and brings meaning to human existence by forcing sound into shapes called words, and carving lines into things called writing. My Lady is a cosmic goddess. I’ve shared this picture before, and called it my personal Saraswati, without much other explanation. It’s a Sino-Tibetan silkscreen that I got off EBay; I have it hanging over my altar. I’ve become very fond of it. Look at that smile! My Lady’s got everything in this picture: the moon in her hair, little geese at her feet, and of course…the dragon. While the smile was what sold me on this particular image, the dragon sheltering My Lady with a flower is a wonderful touch. It may not be the heart of the painting, but to borrow an expression from a mentor, it is the pupils in the eyes. Someone new is in my life…I think? I’m not certain, as it could simply be My Lady in another one of her many guises. The entity in question, anyway, is the Sino-Japanese star deity known as Myōken. Myōken is most often said to be the deity of the polestar, but his identity is quite fluid, hence my confusion. He is known by many other names, and is associated with many other deities in Japanese culture. Japanese polytheism (which is not limited to Shinto by any means) is complex and syncretic, and you can never be sure which deity you’ve got hold of. I came to My Lady Saraswati via her Japanese persona Benzaiten-sama. Yet Benzaiten-sama is not only Saraswati; she is seen as the Bodhisattva Kannon, the Devi Sri, and various others. Her iconography overlaps with Oinari-sama, Dakiniten, and most importantly here, Myōken. Both Myōken and Benzaiten are associated with dragons and magic jewels, for instance. Currently, the cultus I give Myōken is limited to observing the actual stars in the sky, and his shrine is a homemade paper talisman taped to the ceiling above My Lady’s shrine. I feel She has called me to the star god for a reason, if only to gain a greater understanding of Her.